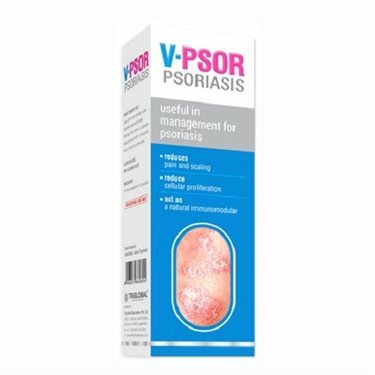 (V-Psor Psoriasis Cream) V-Psor is a blend of herbal ingredients which is useful in management of psoriasis skin disease by reducing pain, scaling and cellular proliferation. It also acts as a natural immunomodulator. Does not contain steroids,Tar or tar products & vitamin D3 Analogues. • Reduces pain and scaling. • Act as a natural immunomodulator. Composition: Oils of marubak seed 50mg, bakuchi seed 250mg, neem leaf 100g, wheat germ 100mg, jaitoon seed 100mg, narikel 300mg. apamarg root 100mg, veeramool 150mg, katundi leaf 75mg, sanay leaf 150mg, haldi rhizome 75mg, kachoor rhizome 100mg, dhatura leaf 225mg, madani seed 50mg, krishnabeej seed 225mg, ashwagandha rhizome 100mg, kumara leaf 300mg excipient and cream base. Direction to use: Apply V -Psor cream gently to the affected area twice daily. Massage the cream in clockwise direction till it get absorbed in skin pores or directed by physician.